Every Bride and Groom wants their dream wedding plan to come true. They have various plans regarding their wedding ceremony. Being a lifetime milestone, the wedding becomes an important event in our life. So, it requires special attention to each and every detail. 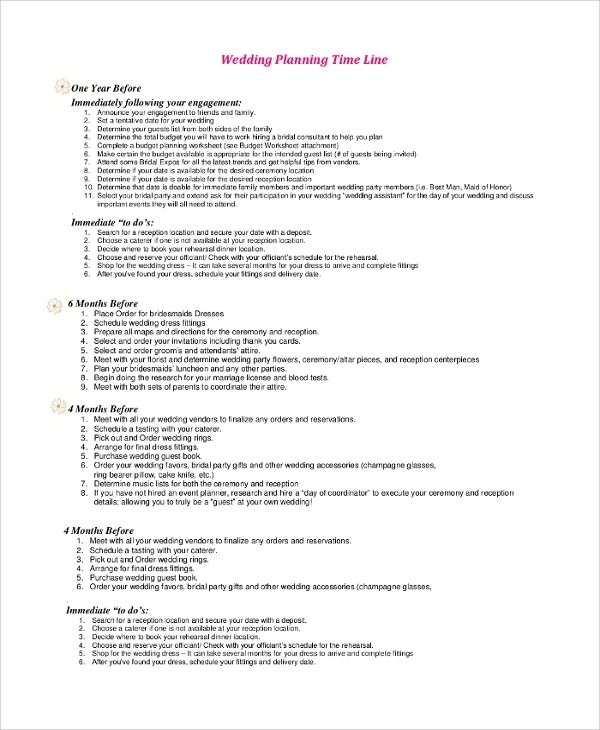 There are various small and big, to-do lists associated with the wedding Timeline Templates. It is necessary to complete them on time to enjoy carefree weddings. It can be done by making a wedding timeline. Now, I am sure you are thinking of few questions like how to make a Wedding Timeline? and Where to get wedding templates? 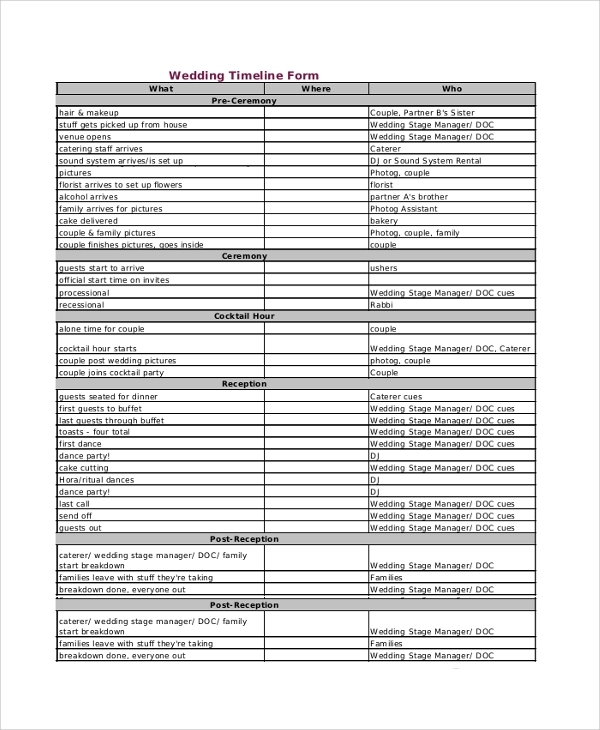 Do not worry, we have provided a list of wedding timeline samples to help you. 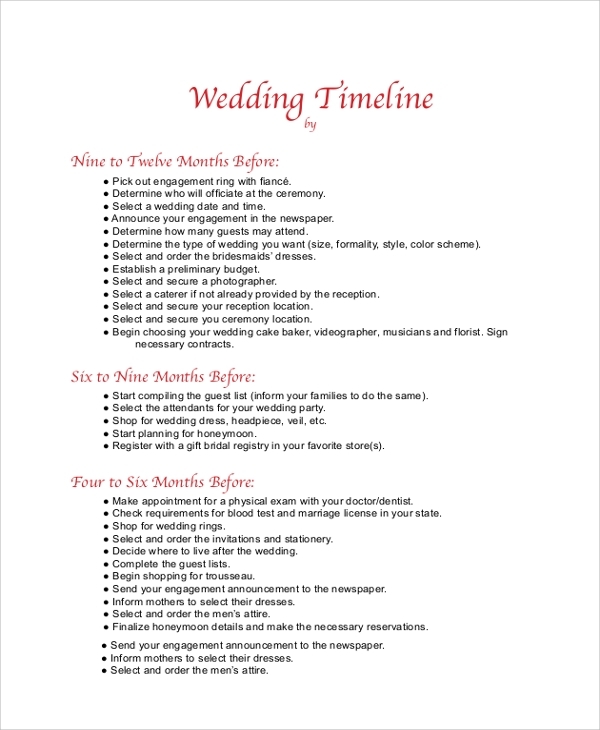 Wedding plan timeline sample PDF is a wedding planner document. This document is the best option to plan a memorable wedding ceremony. It contains a list of tasks along with the timeline. 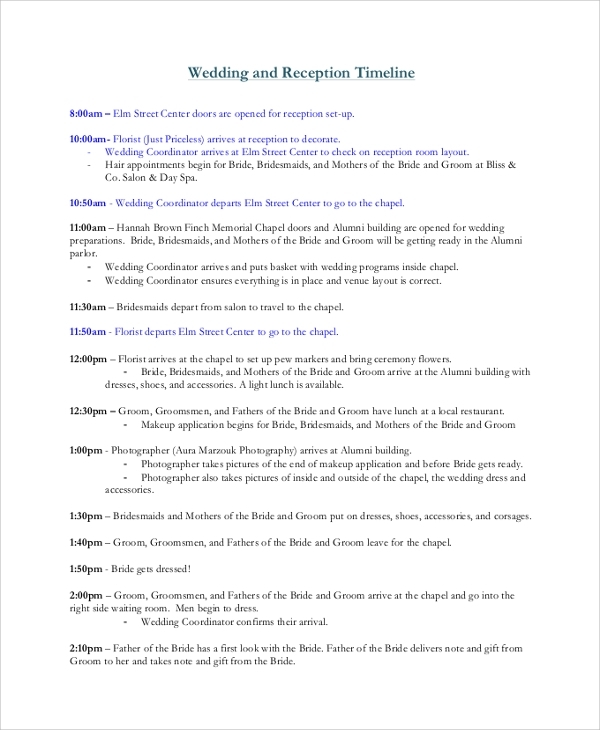 Download the document and take a print out to make a custom wedding timeline. 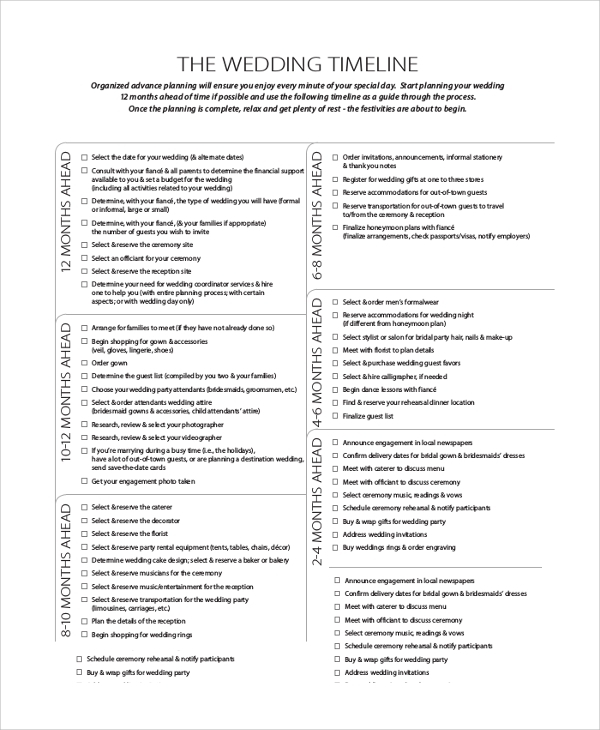 Wedding reception timeline PDF is a perfect solution for plotting a custom wedding coordinator checklist. Prepare a wedding day schedule without missing a single wedding key event. Make a custom action plan and monitor it from the begging to the closing ceremony. 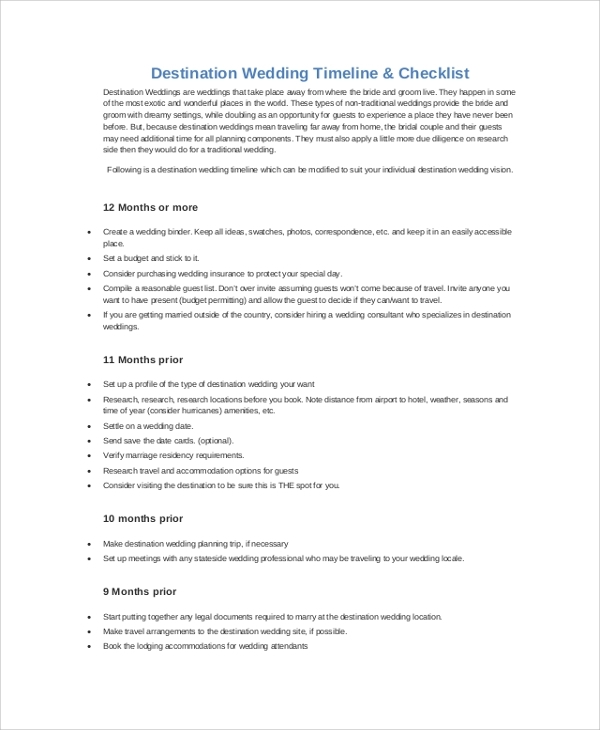 Use wedding timeline checklist PDF to plan a destination or exotic weddings. Download the document and prepare weddings by following it. Make a similar custom action plan and leave no space to troubles and worries at the last moment. Wedding day schedule is the toughest task. 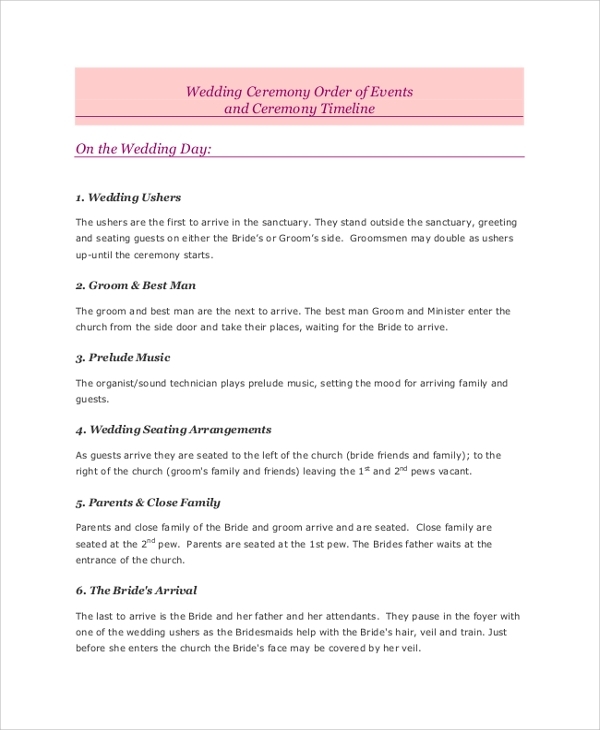 Wedding ceremony timeline PDF has made it an easy task to handle. Get a list of wedding day events and activities and manage it perfectly. Plan perfect wedding day schedule and host a successful ceremony. Who can use this Wedding Timeline? Wedding Timeline Templates can be used by the Bride’s family, Groom’s family, wedding coordinators, and wedding planner agencies etc. A wedding is a one-time event in every Bride’s and Groom’s life. So, everyone wishes to plan a successful wedding ceremony that can be remembered for a long time. This makes it necessary to make a wedding action plan and prepare a to-do list and manage time for hosting successful weddings. Wedding/Marriage Timeline allows us to make necessary changes at any moment without disturbing the schedule. The wedding is a lifetime event, so turn it into a memorable event by using our sample wedding timeline templates. 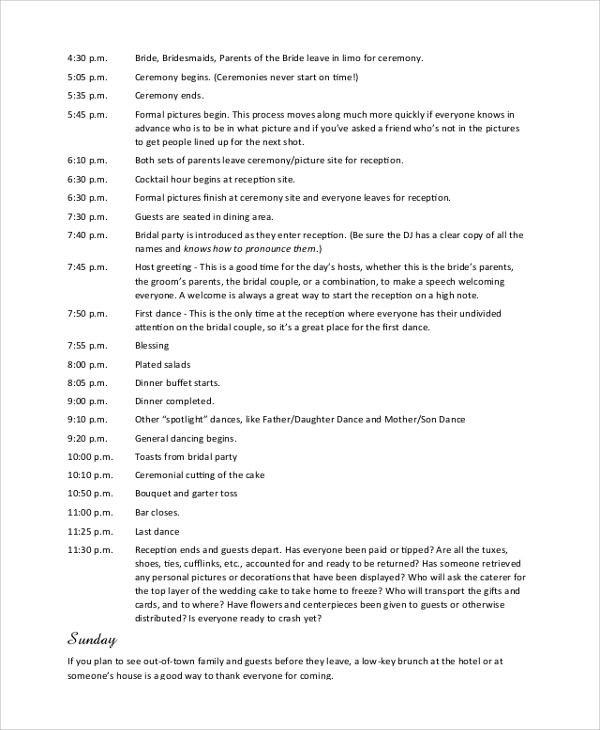 Also, have a look at our wedding itinerary sample templates. Download wedding time sample, sample wedding guest list templates and host a successful wedding event.